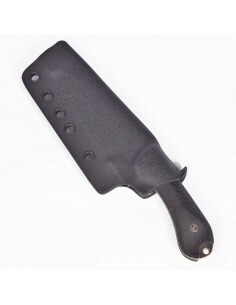 The Bradford Guardian3 Sheepsfoot is newest addition to the Guardian Family, ideal everyday carry knife. As a 3.5 inch fixed blade knife with a full tang, the Guardian3 is a great tool that can be easily carried and concealed on your belt so you can use it throughout the day. Whether you’re working in a warehouse, with wiring or boxes, or you just need to open a bottle at home, the Guardian3 can take care of it.